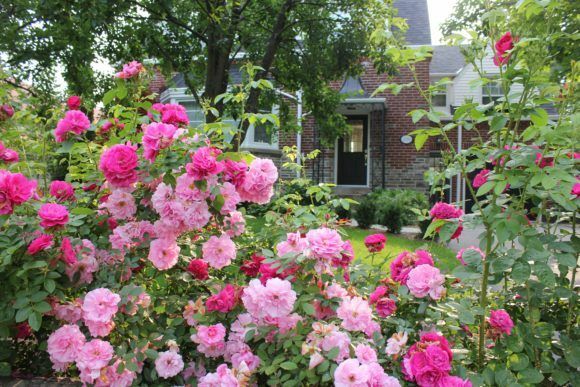 In celebration of the opening of House of Button (the new home of Armchair Auctions), our garden is BLOOMING with ROSES! Enjoy a walk through the garden, browse through the Button Shop, then settle in at Armchair with a cup of tea. HouseofButton is the place to be! 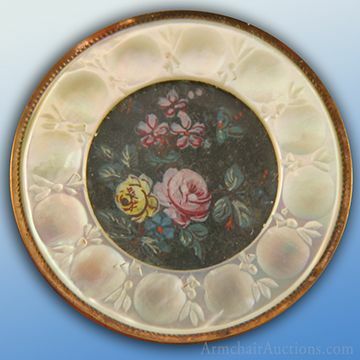 This lovely late 18th or early 19th C. button features a hand painted rose scene set under glass and framed by a pearl border with carved pomegranate design. Lot #2 in our current July 18 Summer Auction. What to Name the Rose? Every year American rose breeders turn out ever more complex crosses. Many are named not for the qualities of the rose but for a person. 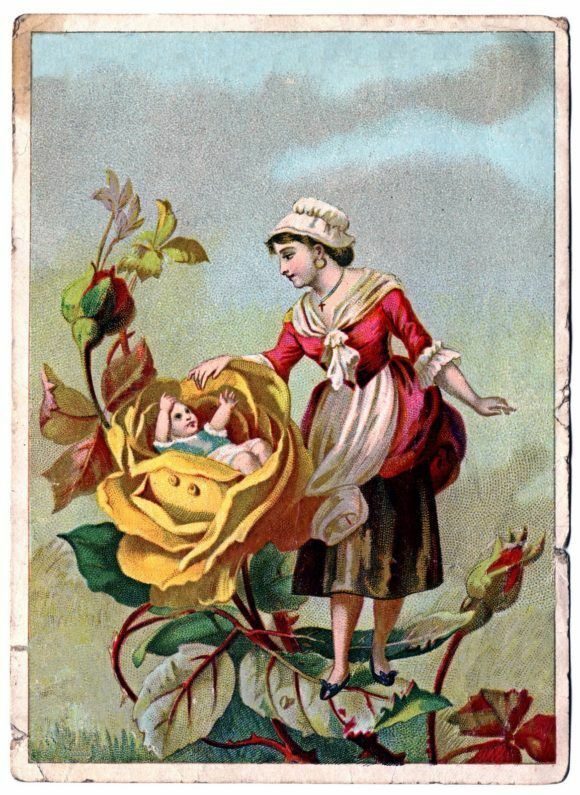 Here’s an article with “A Look at the Strange and Sublime History of Naming Roses”. 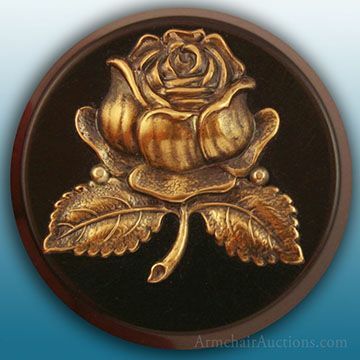 Three similar Rose design buttons in three different materials and three different ages: a 19th C. gutta percha on glass, an early 20th C. brass over bakelite, and a mid 20th C. silver from Mexico. 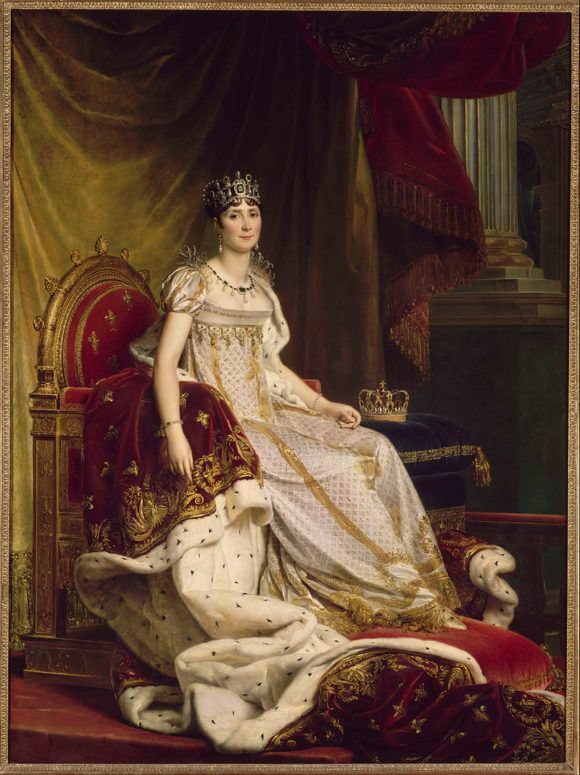 Josephine de Beauharnais, (1763-1814), first wife of Napoleon I, and first Empress of France, was a passionate lover of roses. Her rose garden at the Chateau de Malmaison had almost 250 roses at the time of her death. Her goal, for the garden, had been to obtain every species of rose then known. The idea of “a Rose Garden” grew culturally from Josephine’s efforts. Read more here of the interesting details of her garden. 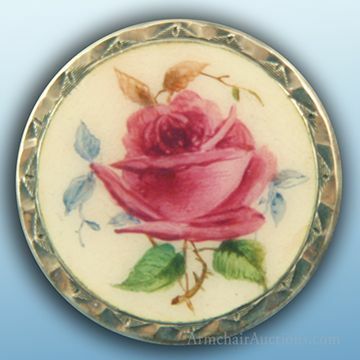 A medium and exquisite enameled rose on a hallmarked Birmingham silver button, ca. 1906. 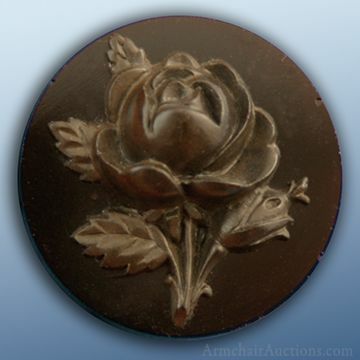 This button sold for $140 in our Spring 2014 auction. 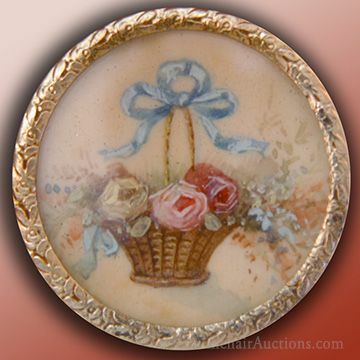 A medium and deluxe handpainted watercolor on ivory of a lovely basket with roses and overflowing blooms. 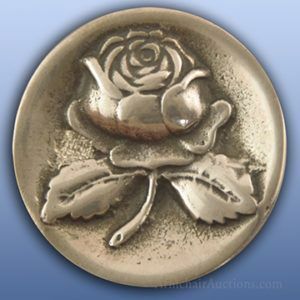 This button sold for $310 in our 2011 Spring Auction. Commissioned by the Empress Josephine to illustrate each rose, Pierre-Joseph Redoute made 117 coloured drawings of roses at Malmaison, which were published in the book Les Roses, in 1817. Here is the Rosa centifolia foliacea. If you are in France . . .
Just south of Paris is the La Roseraie du Val-de-Marne, the famous garden created over a century ago by Jules Gravereaux, famous rosarian (an expert cultivator of roses). 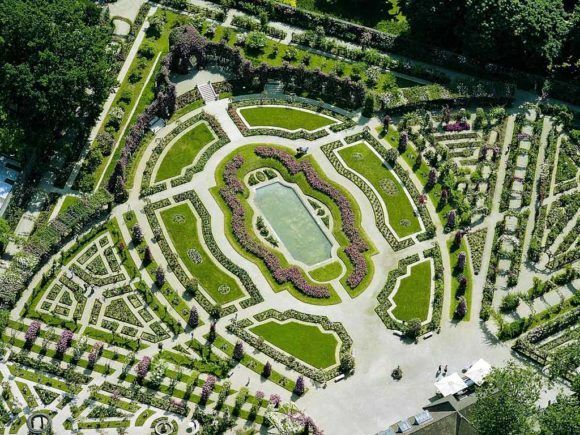 The initial garden collection began with 1600 roses and an overall classic French formal garden design by Édouard François André. The garden reached peak capacity at 8000 roses in 1910, with every type known at the time. Gravereaux first became interested in roses while on textile buying trips while working for Le Bon Marche, the first modern department store founded in Paris in 1852. 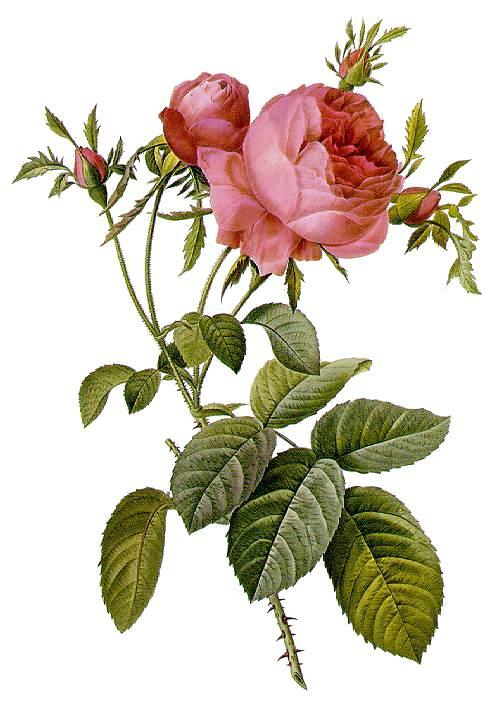 In his garden, Gravereaux hybridized his own roses and made his own rose oil for perfume. 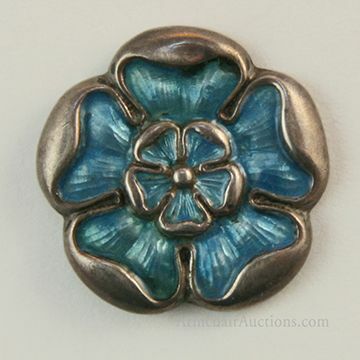 An enamel and silver Arts and Crafts button from the early 20th century in the style of a Tudor Rose. The Tudor Rose is the traditional floral heraldic emblem of England and takes its name and origins from the Tudor dynasty.